India slumped to a 0-2 defeat at the hands of neighbours Nepal, as opposition striker Rekha scored a brace to take the Himalayan nation to three points from two games. This result puts a dent in India’s chances of qualifying for the next round, as they are now level on three points with Nepal and Thailand (as of now). Rekha was the star of the show in an otherwise cagey game, as she scored two second-half goals, to give Nepal their second win over India this month. Just like their previous match at the SAFF U-18 Championship, this was a tight game as well. It was a cagey beginning, as both the sides looked to find their feet. India’s first chance came via captain Jabamani Tudu, who rose above the Nepal defenders to meet a cross from Manisha, but her effort was blocked by the defenders. However, the Indians slowly clawed their way into the game and got their first real chance when Renu broke away from the defence and found herself one-on-one with the keeper. 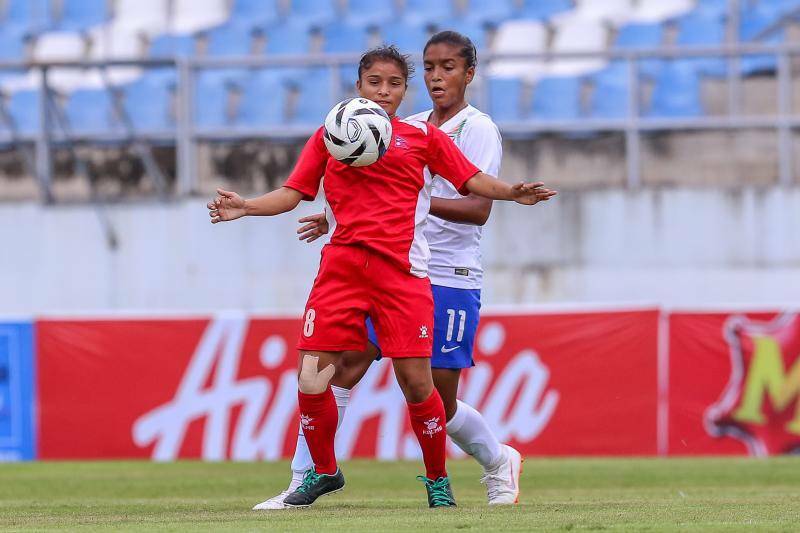 However, her first touch was too poor, and Nepal goalkeeper Anjana came out to collect it. India had another great chance around the 30-minute mark, when Jabamani played out a short free kick from the right flank, towards Roja at the near post, but the winger miscued her shot and the Nepal defence was able to clear it. About 10 minutes later, Nepal had two golden chances, as Rekha broke away twice in quick succession. She found herself one-on-one with the keeper on both occasions, Archana made two fine saves to keep her out. Nepal came out with great gutso in the second half, and constantly posed a threat on the Indian goal. The Indian midfielders often found it difficult to get their game going, as they were swiftly closed down by their Nepal counterpart. In the end, it was a clearance from the half-line by the Nepalese defence, that found Rekha, who beat the Indian offside trap, to go through on goal and slot it past the keeper. India tried frantically to get back on level terms, but some dogged defending by the Nepal defence kept them at bay. With 10 minutes of regulation time left, Manisha played Renu through on goal, but she was flagged offside. Nepal striker Rekha made the result sure with just two minutes left, as she broke away from the India defence again, and dodged past the goalkeeper to score her brace. This result makes qualification for the next round much more difficult for India. The young eves now have to beat hosts Thailand in their final group game, and hope that Pakistan get at least a point from their game against Nepal. INDIA STARTING XI: Archana Arumugam; Pakpi Devi, Samiksha, Kanchan Chanu, Achom Degio; Soumya Guguloth, Bawitlung Vanlalhriattiri, Jabamani Tudu (C), Roja Devi; Renu, Manisha.